Uvas Canyon County Park is a 1,147-acre (464 ha) natural park located in upper Uvas Canyon on the eastern side of the Santa Cruz Mountains, west of Morgan Hill, California. The park has several small waterfalls, some of which flow perennially, that feed into tributaries confluent with Uvas Creek. The park is part of the Santa Clara County Parks System, and facilitates picnics, hiking and overnight camping. It is one of the few parks in the area that allows dogs in the campgrounds. Access to Uvas Canyon County Park is via Croy Road, a two-lane paved secondary road off Uvas Road with no outlet that narrows to a single lane within the small private community of Sveadal, just before the park entrance. In 2017, heavy rains damaged parts of Croy Road as well as much of the park's trail system. After significant repairs, the park has now been re-opened. A partial list of trees and plants found in the park is described in the park's Waterfall Loop Nature Trail Guide. Some are non-native species, brought in by early settlers. California Buckeye tree in the park. The bark, leaves and fruits of the tree are poisonous to eat. However, its flowers provide nectar to butterflies. California Juniper tree in the park. Although native to other parts of California, this one was brought in by early settlers. Canyon Live Oak tree in the park. A variety of fauna forage on the tree's acorns and foliage. Sticky monkey flowers in the park. The yellowish flowers are pollinated by hummingbirds and bees. White alder tree overlooking creek in the park. Thick vines of poison oak have grown around the base of the tree. Convergent Lady Beetles near waterfall trail. Lady Bugs gather in the mountain valleys when they enter their overwintering diapause stage. Red-tailed Hawk sitting on the banks of Uvas Creek near Sveadal. The hawks prey on steelhead trout that periodically appear in the creek. Steller's Jay nesting in a California Bay tree near Sveadal. The birds typically nest in the springtime. Turkey vulture perched in a Redwood tree near Sveadal. The vulture, along with several others nearby, eye carrion below. The streams are rain and spring fed. Even though the streams are perennial, the best time to visit these waterfalls is after recent rains. Basin Falls is around 20 feet tall, and is at an elevation of about 1100 ft. Triple Falls is around 35 feet tall. ^ a b "Uvas Canyon County Park. Parks and Recreation. County of Santa Clara". County of Santa Clara. Retrieved 2014-09-06. 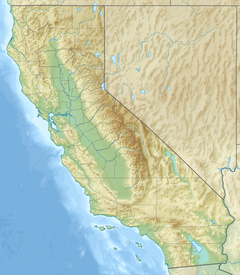 Wikimedia Commons has media related to Uvas Canyon County Park. Leon Turnbull. "Black Rock Falls". Waterfalls of California. waterfallswest.com. Retrieved 2009-12-06. This page was last edited on 20 October 2018, at 14:16 (UTC).